Husqvarna Automower rests in its docking station. Imagine you’re maintaining a property and you run out of trimmer line. You’ll have to hop in the truck and drive back to the shop to get more or have a co-worker drive some out to you—both of which are entirely inefficient. But what if there was another way? In a video screened at a Husqvarna press event called Silent City North America on Feb. 23 in Miami, the manufacturer shared a future where a landscape worker could summon a drone to deliver forgotten items to the job site. 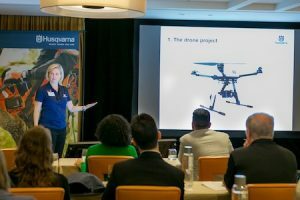 The reel was intended to get attendees’ wheels turning about how technology could impact the future of the landscape maintenance industry. Margaretha Finnstedt, director of public relations and communications for Husqvarna, shares some design concept projects the manufacturer has been working on. The Stockholm-based manufacturer, which has its North American Forest & Garden headquarters in Charlotte, N.C., also teased design concepts for battery-powered products, robotics, virtual reality and sensors incorporated into landscape and tree care equipment. Husqvarna is betting on the future because its research shows urbanization, the digital/technological revolution and environmental challenges in urban areas are three trends coming down the pike, said Michelle Sordi, Husqvarna’s director of marketing for North America. To assess the potential impacts of these issues, the company surveyed 533 landscape architecture students across the globe. About two-thirds of students surveyed said they would like sensors to track the health of green spaces. These include sensors for irrigation, automated lawn care, automatic weed control and fertilization, and automatic hedge care and shaping. Nearly half said robots and drones will be an important part of the maintenance work in the future. 72 percent of U.S. consumers would support companies that use ecofriendly outdoor power equipment over those who don’t. Husqvarna’s experts presented the following products that they said can meet the demand. Husqvarna has been selling the robotic Automower to homeowners in Europe for more than 20 years—to the tune of nearly 1 million units sold at $2,000 to $3,500 apiece. The primary benefits are reduced labor costs and zero emissions, the manufacturer said. Husqvarna is beta launching the product commercially in the U.S. this year along with the Automower Connect app, which lets users remotely control and monitor the machine. If your equipment could talk, what would it tell you? Husqvarna said its new Fleet Services offering—due out later this year at a to-be-determined, subscription-based price point—can tell you just that with sensor data collected by your machines in the field. This information is uploaded to the cloud and available for analysis once your machines return to the shop. The goal is to provide managers and owners with data to prevent breakdowns, make machines last longer, reduce operator fatigue and more. 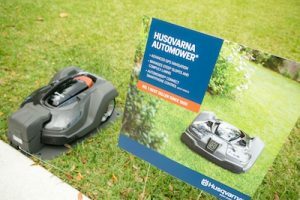 Husqvarna said its Battery Series, which includes chain saws, trimmers, hedge trimmers and blowers, matches the power of its gas equivalent products. With two batteries (one lasting approximately the same time as a tank of gas and the other charging) a pro can work all day, the manufacturer said. User benefits to battery-powered equipment include no direct emissions or exhaust, low noise levels, low vibrations and the low maintenance required of electric-drive, brushless motors, the manufacturer said. After the initial investment to purchase the machines and their batteries, operating costs are negligible compared to gas products that require fuel and maintenance like oil, filters, spark plugs and more.